Instantly get tailored tips on how to optimize your LinkedIn profile. Get seen by the right people and generate 5x more jobs, leads and opportunities. 95% of all recruiters and hiring managers use LinkedIn to find candidates. LinkedIn is more important than ever in building your personal brand and career. However, most people don’t take advantage of LinkedIn. Most profiles on LinkedIn are vague and aren’t optimized for what they’re looking for. This makes your profile harder to find and results in you missing out on opportunities. That's where our AI-powered engine comes in. Our platform gives you detailed tips to improve your LinkedIn profile, in addition to LinkedIn headline examples. Our AI-powered technology identifies gaps in your LinkedIn profile and gives you intelligent tips on how to rank higher on LinkedIn and increase your profile's visibility by up to 5 times. This increases your chances that relevant recruiters and prospects will find you. Unlike any other tool, we identify critical areas of improvement and give you tailored advice, backed up with detailed explanations and examples. The suggestions we give you has been curated by real hiring managers and recruiters at top companies. We know this works. Know exactly how your profile compares to top LinkedIn profiles. We use proprietary algorithms to benchmark your profile and generate a score based on key criteria. Incorporate our feedback to improve your profile's score and your discoverability on LinkedIn. In addition to the detailed tips and suggestions, we also give you real sample LinkedIn headlines and sample summaries. You can use these as inspiration when writing your LinkedIn profile. You may have a strong LinkedIn profile, but your application is incomplete without a strong resume. Did you know that 98 percent of applicants are rejected based on their resumes alone? A better resume ensures that you convert more applications into interviews, thus enabling you to land the job that you want. That's why we offer the following free, recruiter-backed tools that have been used by over 50,000 people worldwide. Increase your odds of landing the interview, every time. 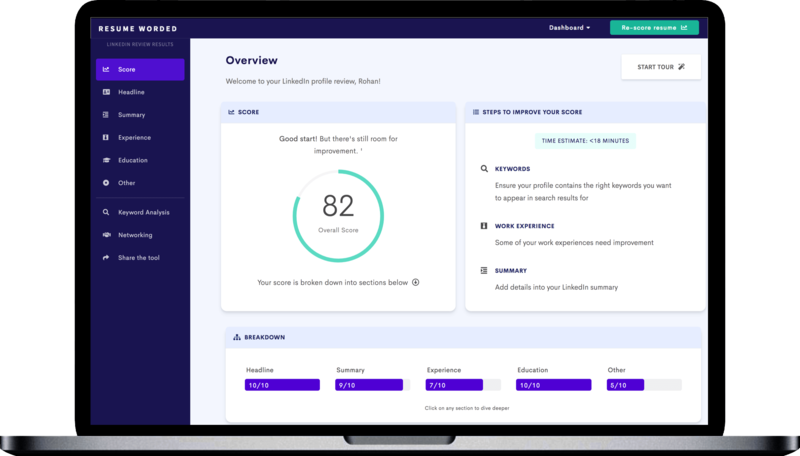 Get personalised recruiter-vetted feedback with our AI-powered scoring engine. Get inspired by real resume lines that top candidates used on their resumes. Proven resume templates optimized for recruitment software. © 2019 Resume Worded. All rights reserved.